"Quagmire" redirects here. For the Family Guy character, see Glenn Quagmire. For other uses, see Quagmire (disambiguation). For other uses, see Mire (disambiguation). A variety of mire types in Carbajal Valley, Argentina. Avaste Fen, one of the largest fens in Estonia. A mire (or quagmire) is a wetland type, dominated by living, peat-forming plants. Mires arise because of incomplete decomposition of organic matter, due to waterlogging and subsequent anoxia. Like coral reefs, mires are unusual landforms in that they derive mostly from biological rather than physical processes, and can take on characteristic shapes and surface patterning. There are four types of mire: bog, fen, marsh and swamp. A bog is a mire that due to its location relative to the surrounding landscape obtains most of its water from rainfall (ombrotrophic), while a fen is located on a slope, flat, or depression and gets most of its water from soil- or groundwater (minerotrophic). Thus while a bog is always acidic and nutrient-poor, a fen may be slightly acidic, neutral, or alkaline, and either nutrient-poor or nutrient-rich. Although marshes are wetlands within which vegetation is rooted in mineral soil, some marshes form shallow peat deposits: these should be considered mires. Swamps are characterized by their forest canopy and, like fens, are typically of higher pH and nutrient availability than bogs. Some bogs and fens can support limited shrub or tree growth on hummocks. For botanists and ecologists, the term peatland is a more general term for any terrain dominated by peat to a depth of at least 30 cm (12 in), even if it has been completely drained (i.e., a peatland can be dry, but a mire by definition must be actively forming peat). Mires are a kind of "...living relic... [A] living skin on an ancient body" in which successive layers of regular plant growth and decay are preserved stratigraphically with a quality of preservation unknown in other wetland environments. Wooded bog in Lahemaa National Park, Estonia. 65% of mires in Estonia have been strongly affected or damaged by human activity in recent years. Extraction of peat from derelict blanket bog, South Uist, Scotland. This old bog is no longer forming peat because the vegetation has been changed, and therefore it is not a mire. Satellite image of burning tropical peat swamp, Borneo. In 1997 alone, 73000ha of swamp was burned in Borneo, releasing the same amount of carbon as 13-40% of the mean annual global carbon emissions of fossil fuels. The majority of this carbon was released from peat rather than overlying tropical rainforest. Mires, although perhaps at their greatest extent at high latitudes in the Northern Hemisphere, are found around the globe. Mires occur wherever conditions are right for peat accumulation: largely where organic matter is constantly waterlogged. The distribution of mires therefore depends on topography, climate, parent material, biota and time. The type of mire - bog, fen or swamp - depends also on each of these factors. In polar regions, mires are usually shallow, because of the slow rate of accumulation of dead organic matter, and often contain permafrost. Very large swathes of Canada, northern Europe and northern Russia are covered by boreal mires. In temperate areas mires are typically more scattered due to historical drainage and peat extraction, but can cover large areas as blanket bog where precipitation is very high (e.g. in maritime climates inland near the coasts of the north-east and south Pacific, and the north-west and north-east Atlantic). In the sub-tropics, mires are rare and restricted to the wettest areas. In the tropics, mires can again be extensive, typically underlying tropical rainforest (e.g. in Kalimantan). Mires are in rapid decline globally due to drainage for agriculture and forestry, and for peat harvesting. For example, more than 50% of original European mire area, more than 300000 km2, has been lost. Mires have unusual chemistry, which influences inter alia their biota and the chemistry of the water outflow. Peat has very high cation-exchange capacity due to its high organic matter content: cations such as Ca2+ are preferentially adsorbed onto the peat in exchange for H+ ions. Water passing through peat declines in nutrients and in pH. Therefore mires are typically nutrient-poor and acidic unless the inflow of groundwater (bringing in supplementary cations) is high. A valley mire creates a level ground surface in otherwise dramatic topography. Upper Bigo Bog, Rwenzori Mountains, Uganda. Mires elevate the ground surface above the original topography. Mires can reach considerable heights above the underlying mineral soil or bedrock: peat depths of above 10m have been recorded in temperate regions (many temperate and most boreal mires were removed by ice sheets in the last Ice Age), and above 25m in tropical regions. When the absolute decay rate in the catotelm (the lower, water-saturated zone of a mire) matches the rate of input of new peat into the catotelm, the mire will stop growing in height. A simplistic calculation, using typical values for a Sphagnum bog of 1mm new peat added per year and 0.0001 proportion of the catotelm decaying per year, gives a maximum height of 10m. More advanced analyses incorporate expectable nonlinear rates of catotelm decay. All types of mires share the common characteristic of being saturated with water at least seasonally with actively forming peat while having its own set of vegetation and organisms. Mires influence carbon dioxide levels in the atmosphere such that when the water table rises, such as during a rainstorm, the peat and its microbes are submerged under water and inhibits the access to oxygen, giving opportunity for anaerobic microorganisms to flourish. Carbon dioxide is released when the water table shrinks, such as during a drought, as this supplies the aerobic microbes with oxygen to decompose the peat, subsequently releasing carbon dioxide. Levels of methane, CH4, also varies with the water table position and somewhat with temperature. Methanogens are responsible for producing methane via decomposition of the peat which consequently increases as the water table rises and oxygen levels are depleted. Increased temperatures in the soil also contributes to increased seasonal methane flux, though at a lower intensity. It is shown that the methane increased by as much as 300% seasonal from increased precipitation and temperature of the soil. Mires are important reservoirs of climatic information to the past because they are sensitive to changes in the environment and can reveal levels of isotopes, pollutants, macrofossils, metals from the atmosphere, and pollen. For example, carbon-14 dating can reveal the age of the peat. The dredging and destruction of a mire will release the carbon dioxide that could reveal irreplaceable information about the past climatic conditions. It is widely known that a plethora of microorganisms inhabit mires due to the regular supply of water and abundance of peat forming vegetation. These microorganisms include but are not limited to methanogens, algae, bacteria, zoobenthos, of which Sphagnum species are most abundant. The peat in mires contain a substantial amount of organic matter, where humic acid dominates. Humic materials are able to store very large amounts of water, making them an essential component in the peat environment, contributing to an increased amount of carbon storage due to the resulting anaerobic condition. If the peatland is dried from long-term cultivation and agricultural use, it will lower the water table and the increased aeration will subsequently release carbon content. Upon extreme drying, the ecosystem can undergo a state shift, turning the mire into a barren land with lower biodiversity and richness. The formation of humic acid occurs during the biogeochemical degradation of vegetation debris, animal residue, and degraded segments. The loads of organic matter in the form of humic acid is a source of precursors of coal. Prematurely exposing the organic matter to the atmosphere promotes the conversion of organics to carbon dioxide to be released in the atmosphere. Wetlands provide an environment where organic carbon is stored in living plants, dead plants and peat, as well as converted to carbon dioxide and methane. Microbial activity is promoted by the large amounts of dissolved organic matter in wetlands, containing 45-50% carbon. Mineralization through bacterial oxidation converts this carbon to inorganic substances, allowing carbon storage to occur. Three main factors giving wetlands the ability to sequester and store carbon are the high biological productivity, high water table and low decomposition rates. Suitable meteorological and hydrological conditions are necessary to provide an abundant water source for the wetland. Fully water-saturated wetland soils allow anaerobic conditions to manifest, storing carbon but releasing methane. Wetlands make up about 5-8% of Earth’s terrestrial land surface but contain about 20-30% of the planet’s 2500 Gt soil carbon stores. Mires, as well as bogs, fens and marshes are the wetland types that contain the highest amounts of soil organic carbon, and can thus be considered peatlands. Wetlands can become sources of carbon, rather than sinks, as the decomposition occurring within the ecosystem emits methane. Natural peatlands do not have a measurable cooling effect on the climate in a short time span as the cooling effects of sequestering carbon are offset by the emission of methane, which induces warming. Despite this, peatlands do result in cooling of the Earth's climate over a longer time period as methane is oxidized quickly and removed from the atmosphere whereas atmospheric carbon dioxide is continuously absorbed. However, in the paper ‘Wetlands, carbon and climate change’ by Mitsch et al., it was determined “that methane emissions become unimportant within 300 years compared to carbon sequestration in wetlands. Within that time frame or less, most wetlands become both net carbon and radiative sinks.” Peatlands insulate the permafrost in subarctic regions, thus delaying thawing during summer, as well as inducing the formation of permafrost. As the global climate continues to warm, wetlands could become major carbon sources as higher temperatures cause higher carbon dioxide emissions. Compared with untilled cropland, wetlands can sequester around two times the carbon, and planted wetlands may be able to store 2-15 times more carbon than what they release. Carbon sequestration can occur in constructed wetlands, as well as natural ones. Estimates of greenhouse gas fluxes from wetlands indicate that natural wetlands have lower fluxes, but man-made wetlands have a greater carbon sequestration capacity. The carbon sequestration abilities of wetlands can be improved through restoration and protection strategies, but it takes several decades for these restored ecosystems to become comparable in carbon storage to peatlands and other forms of natural wetlands. Tropical peatlands comprise 0.25% of Earth’s terrestrial land surface but store 3% of all soil and forest carbon stocks and are mostly located in developing countries. The exploitation of these ecosystems, such as the draining and harvesting of tropical peat forests, releases a large amount of carbon dioxide. In addition, fires caused by dry peat due to the draining of peat bogs releases even more carbon dioxide. The economic value of a tropical peatland used to be derived from raw materials, such as wood, bark, resin, and latex; the extraction of which did not release carbon emissions. Today, many of these ecosystems are drained for conversion to palm oil plantations, releasing the stored carbon dioxide and preventing the system from sequestering carbon again. The planned Carbopeat Project will attempt to assign economic value to the carbon sequestration performed by peat bogs to stop the exploitation of these ecosystems. ^ National Wetlands Working Group (1997). The Canadian wetland classification system (2nd ed.). University of Waterloo, Canada. ^ Geist, Helmut (2006). Our Earth's Changing Land: An Encyclopedia of Land-Use and Land-Cover Change. 2. Greenwood. p. 463. ISBN 9780313327841. ^ Goodwille, Roger (1981). "Peatlands: living relics". Naturopa. Strasbourg (19). OCLC 605722266. ^ Gorham, Eville (1857). "The Development of Peat Lands". The Quarterly Review of Biology. 32 (2): 145–166. doi:10.1086/401755. ^ Joosten, H.; Clarke, D. (2002). Wise use of mires and peatlands. International Mire Conservation Group and International Peat Society. ^ a b Rydin, Håkan; Jeglum, John (2006). The Biology of Peatlands (1st ed.). Oxford University Press. ^ Clymo, R.S. (1984). "The limits to peat bog growth". Philosophical Transactions of the Royal Society of London B: Biological Sciences. 303 (1117): 605–654. Bibcode:1984RSPTB.303..605C. doi:10.1098/rstb.1984.0002. ^ "Wetlands Types and Classifications". www.personal.ceu.hu. Retrieved 2018-04-09. ^ Brown, Alastair (2011-12-20). "Carbon storage: When peat dries". Nature Climate Change. 2 (1): 22. doi:10.1038/nclimate1360. ^ Turetsky, M. R.; Treat, C. C.; Waldrop, M. P.; Waddington, J. M.; Harden, J. W.; McGuire, A. D. (2008-09-01). "Short-term response of methane fluxes and methanogen activity to water table and soil warming manipulations in an Alaskan peatland". Journal of Geophysical Research. 113 (G3). doi:10.1029/2007jg000496. ISSN 2156-2202. ^ Tobolski, K (2000). Przewodnik do oznaczania torfów i osadów jeziornych. PWN. ^ Kuske, E; Silamikele, Inese; Kalnina, Laimdota; Klavins, Maris (2010-01-01). 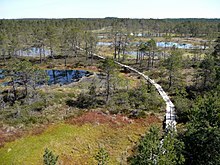 "Peat formation conditions and peat properties: A study of two ombrotrophic bogs in Latvia". Mires and Peat. ^ Environment, Szajdak, L., Polish Academy of Sciences, Poznan (Poland). Inst. for Agricultural and Forest; Improvement, Szatylowicz, J., Warsaw Univ. of Life Sciences (Poland). Dept. of Environmental (2010). Impact of drainage on hydrophobicity of fen peat-moorsh soils. AGRIS: International Information System for the Agricultural Science and Technology. University of Latvia Press. ISBN 9789984451633. ^ Chemistry, Gierlach-Hladon, T., Karol Marcinkowski Univ. of Medical Sciences, Poznan (Poland). Dept. of Inorganic and Analytical; Environment, Szajdak, L., Polish Academy of Sciences, Poznan (Poland). Inst. for Agricultural and Forest (2010). Physico-chemical properties of humic acids isolated from an Eriophorum-Sphagnum raised bog. AGRIS: International Information System for the Agricultural Science and Technology. University of Latvia Press. ISBN 9789984451633. ^ a b c Kayranli, Birol; Scholz, Miklas; Mustafa, Atif; Hedmark, Åsa (2010-02-01). "Carbon Storage and Fluxes within Freshwater Wetlands: a Critical Review". Wetlands. 30 (1): 111–124. doi:10.1007/s13157-009-0003-4. ISSN 0277-5212. ^ a b Mitsch, William J.; Bernal, Blanca; Nahlik, Amanda M.; Mander, Ülo; Zhang, Li; Anderson, Christopher J.; Jørgensen, Sven E.; Brix, Hans (2013-04-01). "Wetlands, carbon, and climate change". Landscape Ecology. 28 (4): 583–597. doi:10.1007/s10980-012-9758-8. ISSN 0921-2973. ^ Köchy, M.; Hiederer, R.; Freibauer, A. (2015-04-16). "Global distribution of soil organic carbon – Part 1: Masses and frequency distributions of SOC stocks for the tropics, permafrost regions, wetlands, and the world". SOIL. 1 (1): 351–365. doi:10.5194/soil-1-351-2015. ISSN 2199-3971. ^ a b "Peatlands, climate change mitigation and biodiversity conservation | Ramsar". www.ramsar.org. Retrieved 2018-04-09. ^ "Carbon sequestration in peat bogs as a source of income". WUR. Retrieved 2018-04-09. Look up quagmire, mire, or peatland in Wiktionary, the free dictionary.